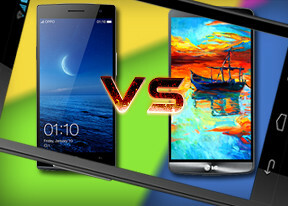 When it comes to design, both smartphones offer differing approaches. LG aimed to minimize the impact of bringing in a larger and higher resolution display, and were able to fit it in a 5.5-inch screen just barely larger than the footprint of the 5-inch LG G2. The Find 7 relies on a pleasantly-textured back panel to help you grip its markedly larger and heavier device. Both smartphones rely on polycarbonate as their primary construction material, although the G3 gets kudos for its faux-aluminum finish and solid construction. Oppo takes a more standard design approach with the Find 7, and relies on capacitive buttons below the display rather than part of it. While looks are certainly a key feature of a smartphone (it's always in your hand or on ear), there are more things to consider before declaring a winner. First off, the LG G3 is significantly more compact and lighter. The exact measurements are 146.3 x 74.6 x 8.9mm and 149g, while the Find 7 comes in at 152.6 x 75 x 9.2mm and 171g. The weight difference is certainly noticeable between the two, and the added 6mm in vertical also makes the Find 7 feel much larger in-hand. Arguably the most important measurement here is width where both phones are fairly close. The width of the G3 is on par with that of the larger device, and in terms of usability is not ideal, as your thumb has a long way to travel in one-handed operation. Oddly, the shorter vertical plays against the G3 in this case, as it makes the device feel too wide in the hand. Neither of the first generation QHD devices has an IP certification against dust and water ingress, so it can't be said that one device has an advantage over the other in this regard. Since the G2, LG has moved its physical buttons from below the screen to the display itself, while the power/lock and volume rocker are located below the camera lens on the back as part of the company's proprietary control deck. It's been refined since its initial implementation and both the volume rocker and power/lock button feature pleasant textures. Oppo takes the more conventional approach of placing its physical buttons on both sides of the device, while retaining its capacitive buttons below the screen. The illumination of the Back, Home, and Menu keys on the Oppo is extremely low, which makes it hard for first time users as you simply can't see what button you're pressing. The G3 relies on on-screen buttons for the same purpose, with varying transparency so as not to obstruct the interface. Both devices have their USB ports on the bottom next to the primary microphone. The G3 also has its 3.5mm audio jack here. Both devices feature speakers located on the back, rather that front-facing ones like on some of their competitors. The Find 7 has a small nub to keep the speaker from getting completely muffled by the surface it's resting on, while the G3's curved rear panel accomplishes the same task. The 13MP cameras of the two devices are flush with the back, so you don't get the wobble you would on devices with protruding camera modules. The lens on the G3 is more indented than that of the Find 7 to prevent scratching. The back panels of both devices are removable, revealing user-replaceable batteries underneath. Both smartphones have 3,000mAh units, with the panel on the G3 being slightly easier to remove than that of the Find 7. Winner: LG G3. While both devices are made of polycarbonate, the LG G3 is the better looker thanks to its curved back and faux-aluminum texture. While it's slightly too wide for one-handed operation, the fact that LG was able to fit in the same 5.5-inch display into a significantly smaller frame than the Find 7 is quite an accomplishment.